← How to revise the line of the textbox when it’s added to a pdf file? Portable Document Format, PDF, is created for keeping a document rendered without dependence of document processing applications, displaying devices or Operating Systems. A PDF file packs all required information and elements in one single portable file and reproduces the visible pages without dependence of its displaying condition. 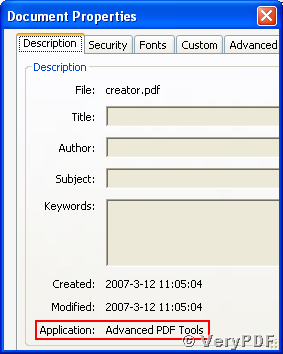 With the displaying description, several preset property items for describing the file are encapsulated in a pdf file, which are “Title”, “Author”, “Subject”, etc. Besides these preset description items, you may also add your customized items into the file and keep them accessible in other runtime environment. Here is a software that can modify almost all of the supported property descriptions of a pdf document, the program of Advanced PDF Tools. where option “-i” and argument “input.pdf” specify the source pdf document for process and “-o” and “output.pdf” specify the name of output document. If omit the “-o” option and its argument, the source input document will replaced by the output one. The following words will describe the options of processing the pdf descriptions. 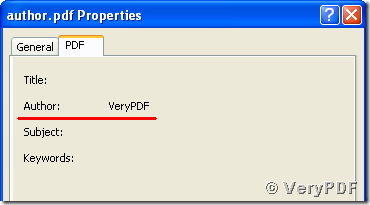 pdftools -i help.pdf –r <Enter>. The following is the screen snapshot of part of the runtime window. Below will come the options for setting the preset description items of a pdf document. pdftools -i help.pdf -o title.pdf -t "Demo Title" <Enter>. After executing the commands, check the property descriptions of the new output document named “title.pdf”, using the command line pdftools -i title.pdf –r <Enter>, you will see the “Title” description is set to “Demo Title” as presented below. You can also check the property with the “Properties” dialog of the Windows Operating System as follow. the pdf description of “Author” is set to “VeryPDF” as presented in the following snapshot. 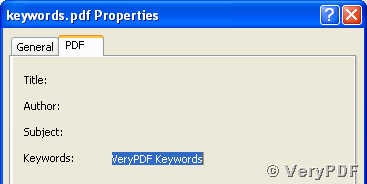 pdftools -i help.pdf -o keywords.pdf -k "VeryPDF Keywords” <Enter>. 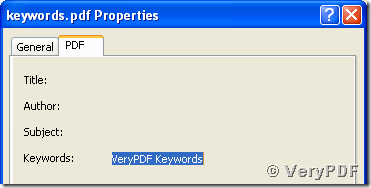 The “Keywords” of keywords.pdf is now “VeryPDF Keywords” as shown in the following snapshot. 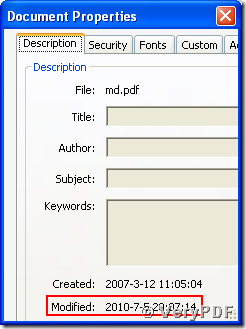 pdftools -i help.pdf -o cd.pdf -d "20100705180604+08'00'" –e "" <Enter>. The snapshot below presents the effect. 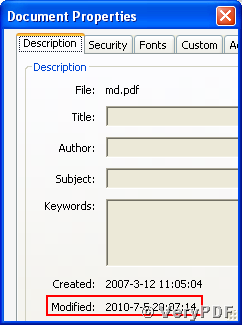 pdftools -i help.pdf -o md.pdf -m "20100705200714+08'00'" <Enter>. And the result is presented in the following snapshot. 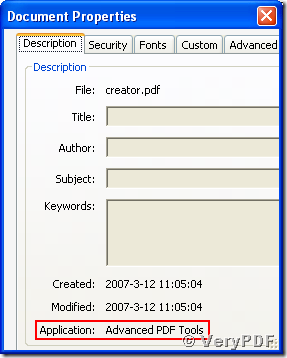 pdftools -i help.pdf -o creator.pdf -c "Advanced PDF Tools" –e "" <Enter>. The next snapshot shows the result. 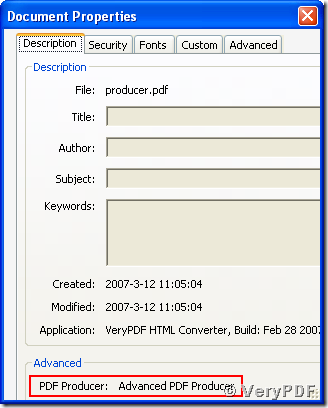 pdftools -i help.pdf -o producer.pdf -p "Advanced PDF Producer" -e "" <Enter>. 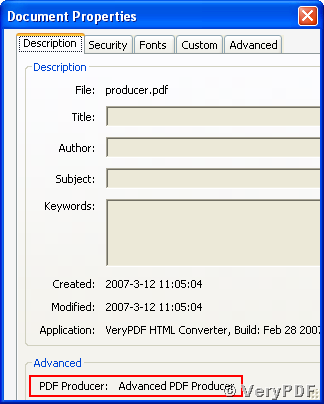 With executing the commands above the pdf description of “Producer” is set to “Advanced PDF Producer” as presented in the following snapshot. There are more options supported by Advanced PDF Tools for modifying the descriptions of pdf files. For more information about the software, please see http://goo.gl/MVwoy. This entry was posted in Advanced PDF Tools and tagged Advanced PDF Tools, command line, pdf, PDF Description, PDF property. Bookmark the permalink.